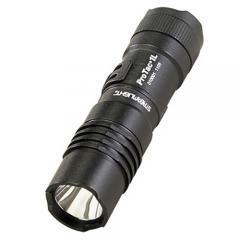 The Streamlight PT 1L Professional Tactical Flashlight is an ultra-compact, extremely portable light that still provides enough output for tactical use. Its C4 LED delivers a powerful 180 lumen beam on its high setting, and also features a power-saving low setting as well as a strobe mode for additional versatility. Ten-Tap programming allows you to choose between high only, high-low and high-strobe-low modes for convenience, and its push-button tail switch is easy to use. Solid state power regulation systems provide consistent light output, so it won't dim as your battery runs low. The PT 1L is made from rugged aluminum and tempered glass, making it highly resistant to impacts, and also boasts IPX7 waterproofing to one meter for 30 minutes. It comes with an unbreakable pocket clip for convenient carry, and its anti-roll head keeps it in place when set down for hands-free lighting. I bought this light as a backup for my wife. She is a felony probation officer and works in the N. Georgia mountains. She has to work at night and her state issue is a Streamlight Strion. This light is a very very bright light for its size. She is very happy with it as it is perfect size for a backup and as I said is very bright. Quality is excellent and the 10 tap feature is nice. Best pocket flashlight I have ever owned. Bought this one to replace one stolen from luggage.